"And do not fear those who kill the body but cannot kill the soul. Rather fear Him who can destroy both soul and body in hell" (Matthew 10:28). "Though He slay me, I will hope in Him; yet I will argue my ways to His face" (Job 13:15). Do you trust God? It's one thing to say you do, but it's another thing to honestly do so. In times of plenty - bills are all payed with a little left over, everyone in the house is in good health, and work is going well - it is easy to trust God. We praise Him happily because all our needs have been met and we feel so emotionally good that we aren't worried or concerned about much at all. We love God! 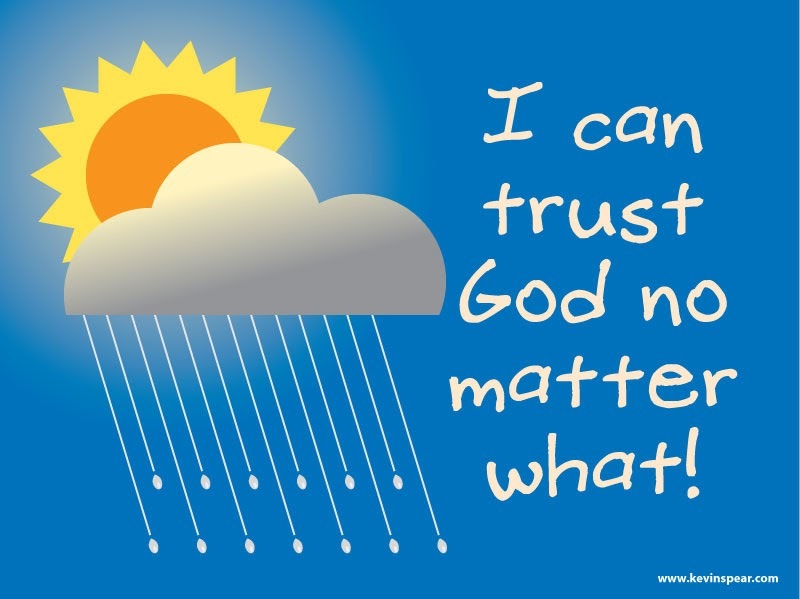 But in times of want - some bills are past due, the baby is sick and keeping you up at night, and your co-workers have been frustrating to work with - does your trust in God continue? Do you continue to praise Him? Do you continue to worship Him? Is God's worth based upon your circumstance? Or do you honestly, truly, passionately trust Him - no matter what? When it comes to our health, safety, security, and well-being, we are very selfish. Last week, my family and I woke up to horns honking, voices shouting, and doors slamming - at two o'clock in the morning. Alarm jolted me from my bed to the window. I looked out to see about thirty cars lined up down the street and numerous people filing into our neighbor's house. The bars had closed and this was the after party. I shook with a mix of anger and fear. What would these people do in that house? What if they came out of the house? They were already disrupting my sleep and the sleep of my family; now, they were infringing upon my safety and peace of mind. I came back to bed, declaring to put the house on the market the next day. Earlier this week I received a message from a close friend who said his garage had been broken into and many things were stolen. His family was safe, but he was justly concerned after having his personal property damaged and stolen. Then, I read the story of Job in the Old Testament. Everything was taken from that man. Everything. Where was God in all of these circumstances? "God, I trusted you to take care of me! I'm Your child and You're my Father! How could You let people infringe upon my safety? How could You allow Your children's property to be burglarized? How could You allow Your righteous servant to have his entire family killed, all his property destroyed, and his own body filled with disease? I thought I could trust You...."
Oh, man, how wicked and selfish are your ways. Do you not know that it is the Lord God who holds His people in perfect peace? Do you not know that it is the Lord God - Your Heavenly Father! - who watches over you and keeps your foot from slipping? Do you not know that it is the Lord who holds your future in His hands - who gives you breath, life, and all things? Oh, man, how wicked and deceitful are your thoughts against the Lord Almighty. Though the Lord God slay me, still I will trust in Him, for He is good always. His ways are perfect, holy, and righteous. The worst that can happen to me is death. Yet even though He slay me, still I trust in Him - for He has defeated death through Jesus Christ and not even the grave has victory or authority over Him; as a result, nor does death have mastery over His children! Do not fear man, no matter how evil his ways or wicked his intentions; instead, fear the One who has absolute authority over death - to condemn some to hell and raise some to life! In this truth, Christ is supreme and over all things, and He will surely see to it that His children do not see corruption or death. Indeed, His children can trust Him. For further peace and comfort in your life, read the following verses and listen (or watch) the song by Shane and Shane entitled "Though You Slay Me." "For the LORD is good; his steadfast love endures forever, and his faithfulness to all generations" (Psalm 100:5). "Give thanks to the LORD, for he is good, for his steadfast love endures forever" (Psalm 136:1). "Oh give thanks to the LORD, for he is good, for his steadfast love endures forever!" (Psalm 107:1). "O taste and see that the LORD is good; How blessed is the man who takes refuge in Him!" (Psalm 34:8). "This God—his way is perfect; the word of the LORD proves true; he is a shield for all those who take refuge in him" (2 Samuel 22:31). "The law of the LORD is perfect, reviving the soul; the testimony of the LORD is sure, making wise the simple..." (Psalm 19:7). "We know that Christ, being raised from the dead, will never die again; death no longer has dominion over him. For the death he died he died to sin, once for all, but the life he lives he lives to God. So you also must consider yourselves dead to sin and alive to God in Christ Jesus" (Romans 6:9-11). "He will not let your foot be moved; he who keeps you will not slumber" (Psalm 121:3). Lord God, I thank You that You are a good Father. Thank You that You are trustworthy and true always. Lord, please help us to trust You; this is how we have peace, joy, hope, and love. It is "perfect love which casts out fear." Thank You that You are perfect love. Amen.